Gold rallied overnight in a range of $1331.80 - $1343.15. 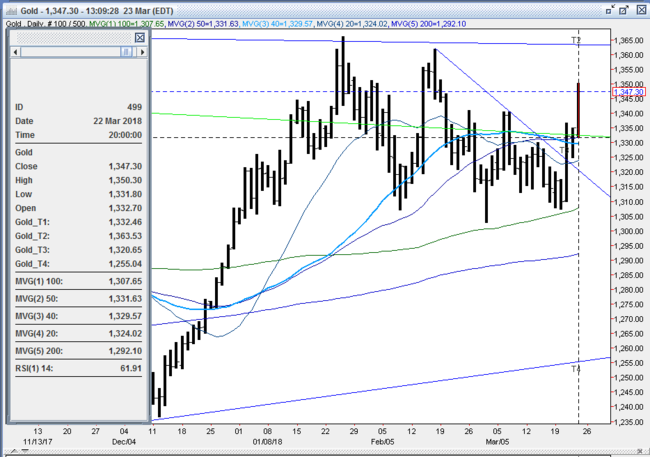 It took out resistance at the triple top at $1341 to propel it to its high, fading a softer dollar (DX from 89.87- 89.54). The greenback was pressured by strength in the safe haven yen (yen to 104.65 – 16 month high) and was helped by a fear of a trade war escalating as the Chinese responded with tariffs of their own (128 products, but only $3B), and threatened legal action with the WTO. Gold was also aided by a plunge in the US 10-year yield to 2.792% - a 6-week low, and a heavy selloff in global equities following the drubbing US stocks received late yesterday afternoon off of the US tariff announcement. The NIKKEI fell 4.5%, the SCI lost 3.4%, Eurozone shares were off 0.6% - 1.6%, and S&P futures tumbled early to a low of 2619 (off another 0.9%). A jump in oil (WTI from $64.11 - $65.42, hints of OPEC extending production cuts through 2019) helped limit the damage in equities. A Trump move replacing NSA head McMaster with the hawkish John Bolton was also seen as unsettling for markets and gold supportive while news that the US Senate passed the $1.3T spending bill to fund the government through September was only a mild headwind for gold. Just ahead of the NY open, dovish comments from the Fed’s Bostic (labor markets not yet overheated, supports only gradually raising rates to neutral level of just 2.25-2.75% [much lower than mean of over 3%], significant tariffs represent downside risks) helped boost the already recovering S&P futures (from 2638 to 2645). 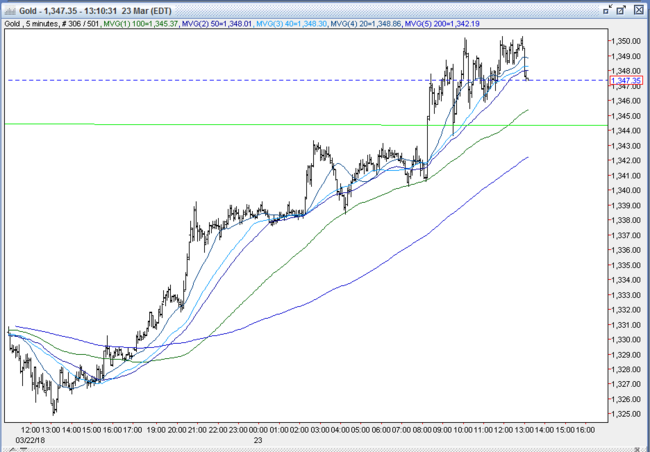 Gold took out its overnight high and raced to $1347 – where resistance at the 2/20 high held. At 8:30 AM, a much stronger than expected Durable Goods Report (3.1% vs. exp. 1.6%) pushed S&P futures up to 2651, and brought the 10-year bond yield up to 2.852%. The DX ticked up to 89.63, and pressed gold back to $1345. Around 9AM, a tweet from Trump saying he is reluctant to sign the spending bill (no mention of DACA, border wall not fully funded) knocked the S&P back to 2642 (-1), and pushed the 10-year yield down to 2.83%. The DX took out its overnight low and tumbled to 89.48. This pushed gold through its prior high to reach $1350.20 (1-month high) where it was capped at the $1350 – 52 triple top (1/29 , 2/1, and 2/2 highs). By late morning, US stocks recovered (S&P +12 to 2655, utilities and energy sectors lead advancers), helped by oil making a fresh high (WTI to $65.58), and a strong debut by the DropBox IPO. The 10-year yield ticked back up to 2.843%, and the DX bounced to 89.60. Gold pulled back in response, but was supported at $1345.50. Into the afternoon, US stocks turned back lower (S&P -18 to 2625, financial and tech lead decliners). The 10-year yield turned down as well and touched 2.825%. The DX fell to a new low at 89.44, but was supported ahead of yesterday’s low and double bottom at 89.39. Gold turned up, but was capped again at resistance at $1350. Open interest was up 11.5k contracts, showing a good chunk of new longs from yesterday’s rally. Volume was lower but still very robust with 443k contracts trading. All markets will continue to focus on the volatility in the equity and bond markets, geopolitical events, developments with the Trump Administration, oil prices, and will turn to this afternoon’s Commitment of Traders Report, followed by reports Monday on the Chicago Fed National Activity Index, the Dallas Fed Manufacturing Activity Index, and comments from the Fed’s Mester for near-term guidance.